Ministers have unveiled a new approach for enhancements to the rail network in England and Wales, alongside a call for 'market-led' proposals for enhancements. The Department for Transport said the new approach to the Rail Network Enhancements Pipeline(RNEP) would ensure that taxpayer-funded rail projects are planned and scrutinised more effectively in the future. Under the new process, new rail schemes will be decided on in a staged process to allow for greater assessment of feasibility and value for money. ‘The first three stages, “Determine”, “Develop” and “Design” are characterised by increasing levels of detail and understanding. The final two stages are, “Deliver” and “Deploy”. 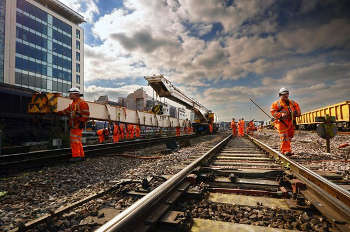 Network Rail’s £47bn budget for Control Period 6 (CP6), which runs from 2019-24, mainly covers maintenance and renewals, with around £10bn to fund enhancements, mostly those that were deferred from CP5. Further enhancements would be approved on a case-by-case basis and paid for from a variety of sources. The call for ideas on market-led proposals for enhancements was launched by transport secretary Chris Grayling with a specific request for private companies to come forward with ideas to deliver a new southern rail link to Heathrow Airport. The DfT said this was ‘just one example of ambitious proposals that would generate significant improvements for passengers across the entire network, creating a new tier of investment in rail infrastructure from the private sector’. ‘Proposed schemes would need to make commercial sense, build on the Government’s significant investment in rail infrastructure and have the needs of passengers at their heart, without the over-arching need for government support,’ officials added.